Over on Feministing, Ina May Gaskin suggests that feminists and other women can learn more about bodily autonomy by watching videos of … elephants and chimps! Who knew that elephants were feminist? 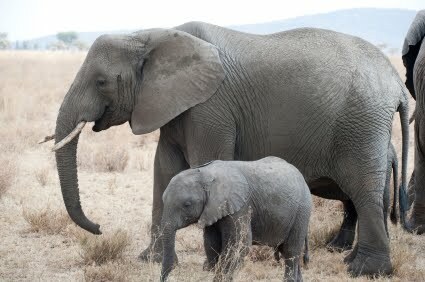 Who knew that elephant birth had anything to do with human birth? Ina May, that’s who. I asked Ina May what could our readers do to learn more on the topic of bodily autonomy and birth, and she suggested watching the two videos after the jump, of an elephant and chimpanzee giving birth. Apparently we have a lot to learn from these animals! We’re so affected by prudery and corporate media that you don’t get to see the reality of birth on television unless you go to YouTube. I’d say type in “The Dramatic Struggle for Life.” There, you’ll see an elephant give birth. Her baby doesn’t breathe spontaneously and she has to resuscitate the baby. That’s powerful to watch. So watching elephant birth shows the reality of human birth? And what exactly does the fact that the elephant baby doesn’t breathe spontaneously tell us about women’s bodily autonomy? Evidently nothing. The second I’d recommend is “Chimp Birth Attica Zoo” and there you see a chimpanzee give birth and labors in a position that nobody would ever guess that anyone would take [upside down]. But, you watch her expertly give birth without any damage to herself with definite calm and perhaps pleasure. Or perhaps agonizing pain. But I guess Ina May fancies herself a lay expert of chimp sexual satisfaction as well as midwifery. And what does this have to do with women’s bodily autonomy? Once again, absolutely nothing. Did Ina May interview the elephant and the chimp? Oh, I get it, she intuited that those animals were not afraid. And she was able to intuit their feelings just by watching the videos. Birth has been commodified so escaping it is like finding your own wild nature. If you choose to go to a hospital, which I’m not putting down, then I suggest be wild when you’re there and you’ll teach ‘em something! Teach ’em what? That you listen to the ravings of wacky self-appointed birth experts? What does being wild with uncontrollable pain have to do with women’s bodily autonomy? Nothing, of course. And why isn’t employing technology (an epidural) so you won’t have to be wild with pain an expression of women’s bodily autonomy? Because Ina May says so. Honestly, I can’t imagine why anyone (let alone feminists) takes this woman seriously. She lives in a cult, has no training in midwifery, let one of her own children die without seeking medical attention, and can’t tell the difference between an elephant and a human being. Will some one please explain to me how anyone with a modicum of intelligence could believe anything she says?